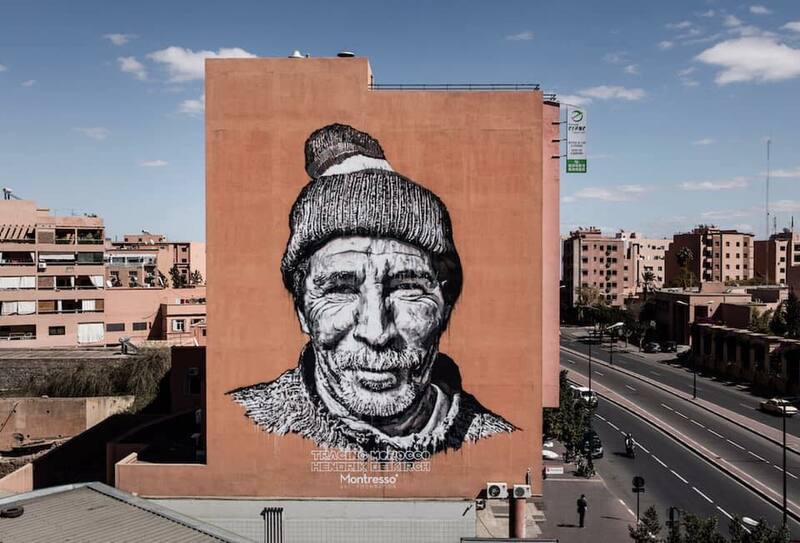 Artists have turned the cities of Casablanca, Rabat, and Marrakech themselves into live canvases. Writing on walls is a practice old as time. Literally. 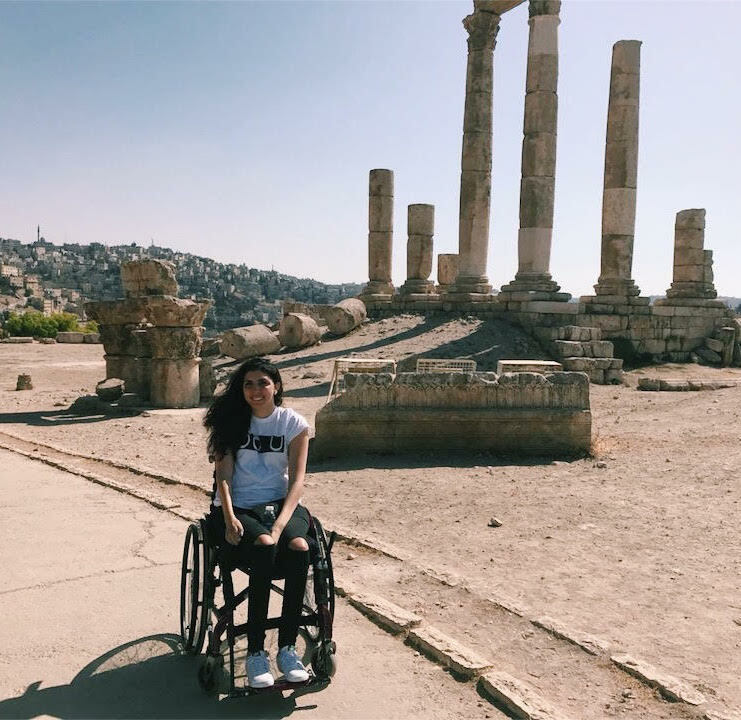 With different historical eras, from prehistoric cave paintings to hieroglyphics to young couples defacing said hieroglyphics with the artistic genius of "Ahmed+Mona=4Ever", humanity has developed different ways of proving to ourselves and the generations after us the profoundly human assertion: "we were here." 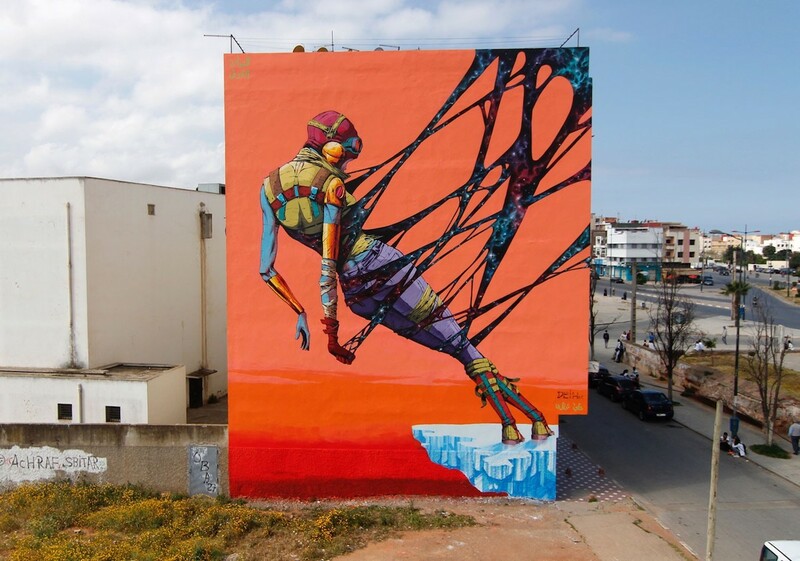 Though modern street art and graffiti are rooted in this same impulse, they've also morphed to different ends. We've developed a certain expectation of street art: rebellious, avant-garde, and fundamentally counterculture. Street art, though now perhaps a separate category from 'graffiti', is forever inextricably linked to the same subculture that birthed hip hop: in American cities starting the 1960s, predominantly Black youth claiming urban space for themselves, both as individuals and the evolving gang culture that gripped inner cities. By claiming streets and walls, the practice flies in the face of what are perhaps two fundamental tenets of modern society: that the state owns public space, and the sanctity of private property. 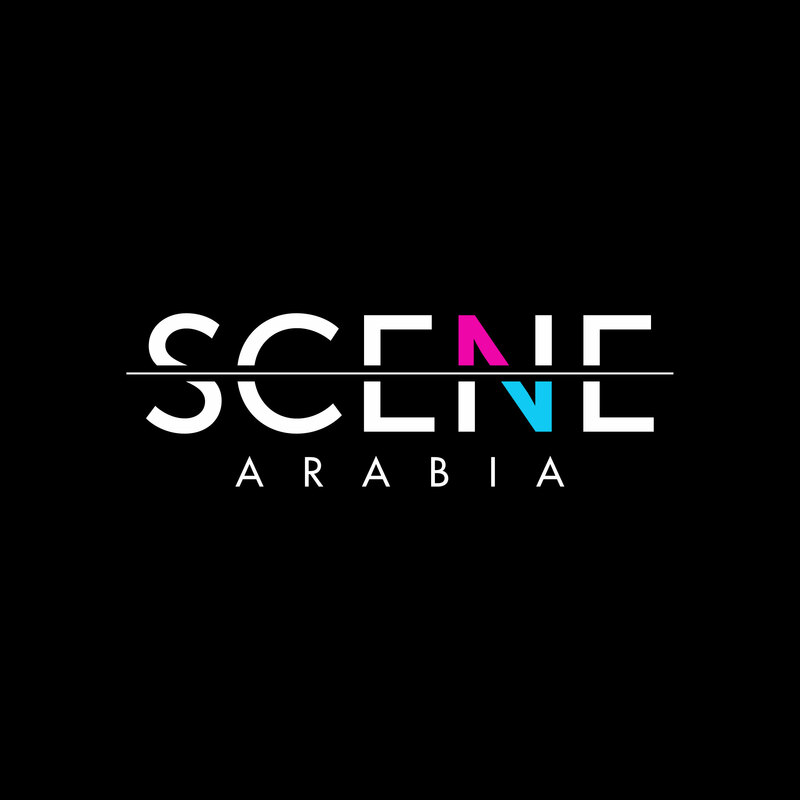 While the subcultures have undoubtedly shifted with decades and thousands of kilometres, street art in the Arab World is still often a function of the everyday claiming of space (as in Egypt's 'calligraffiti' landscape) or an act of political resistance (as in the apartheid wall in Palestine). 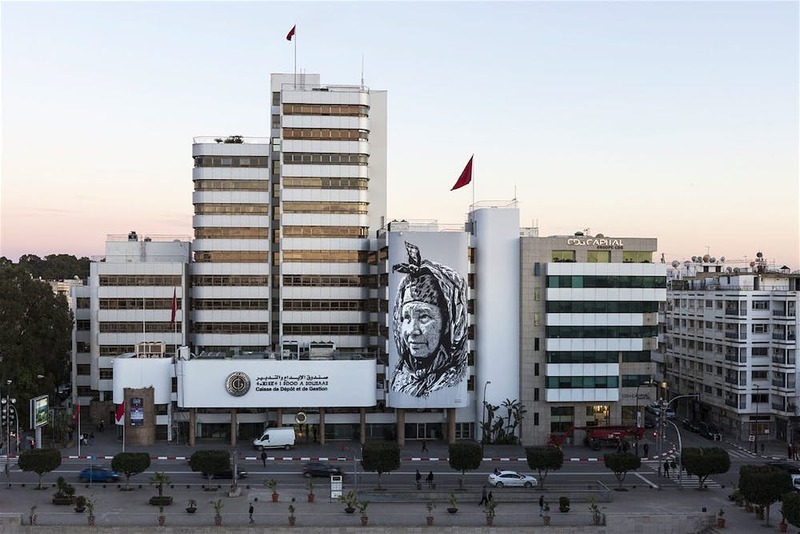 The giant murals by international artists in Morocco, however, tell a very different story, of widespread, systematic support of art in public space. 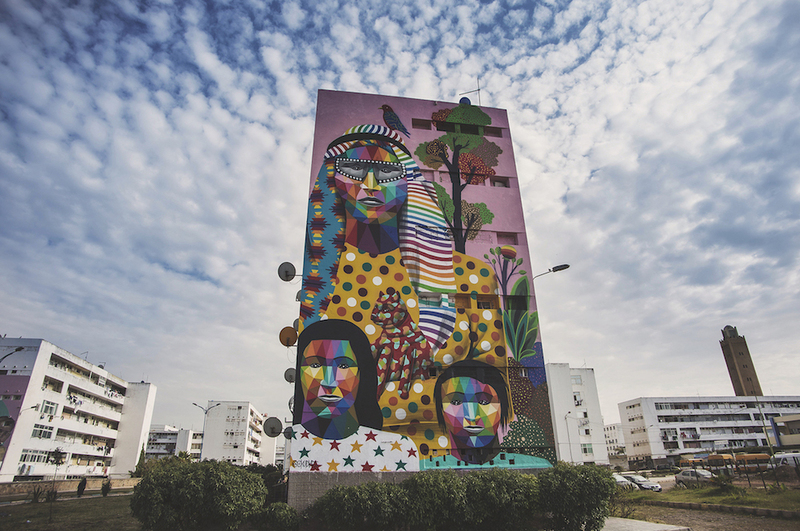 As a result, the booming street art scene in Morocco is one of large, curated events giving space to both local and international artists to transform entire cities into living canvases. 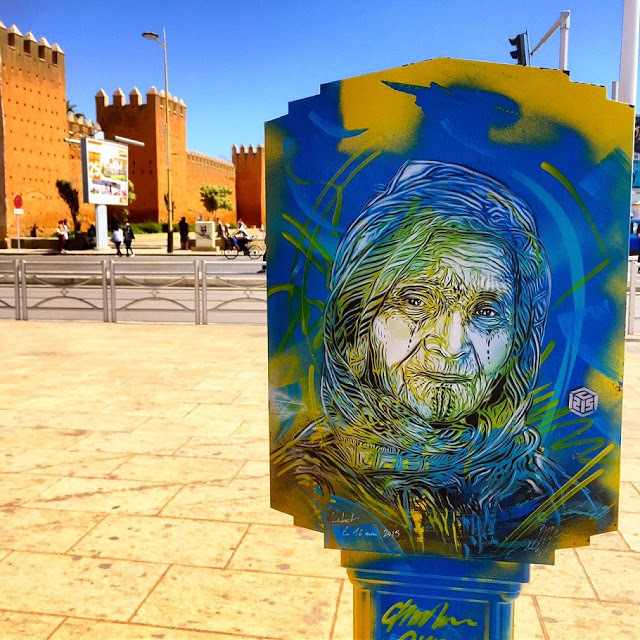 Chief among these events are Jidar - Toiles de rue, an annual congregation of a dozen international and Moroccan artists in Rabat, and the Sbagha Bagha Casablanca Street Art Festival, both organised by the same non-profit, EAC - L'Boulvart, which supports contemporary music and urban culture in Morocco. The development of these and other festivals, funding by the Moroccan government, and collaborations with institutions such as Maroc Telecom, the Fine Art Academy of Casablanca, and the Marrakech Biennale, initiatives like these have turned the streets of Rabat, Casablanca, Marrakech, and even smaller cities such as Safi and Essaouira into perhaps the Middle East's most exciting art studio. 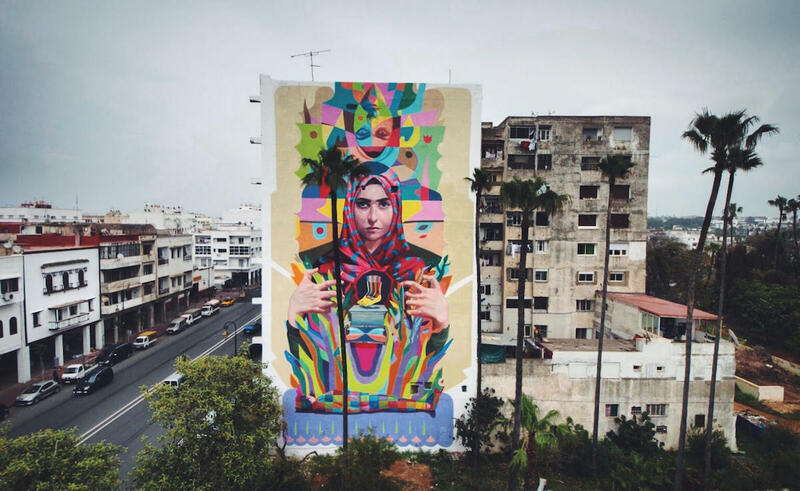 Moroccan street artist Abid explored, for his series 'Berberism 2.0' the intersection between Berber culture and futurist aesthetics, focusing on the concept of 'glitch'. Photo courtesy of Placebo Studio. 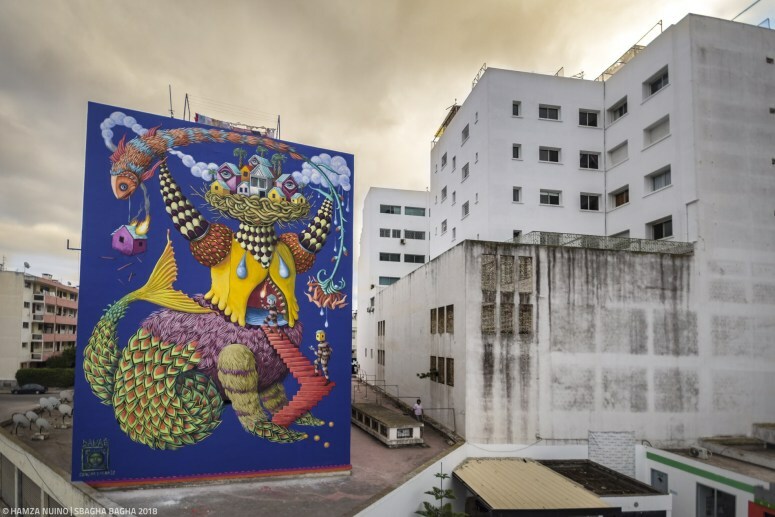 An untitled work by Colombian street artist Gleo for Jidar 2017, Rabat. 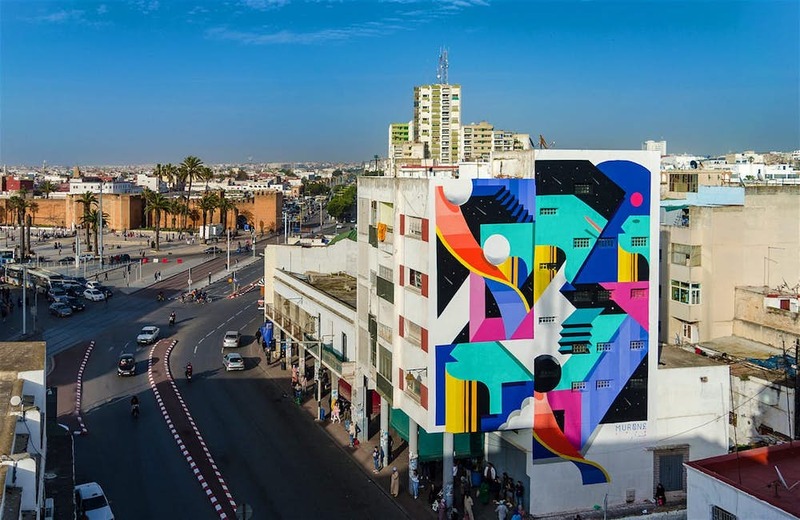 For Jidar 2018, Spanish artist Deih painted this 'Cosmic Balance' in the streets of Rabat. 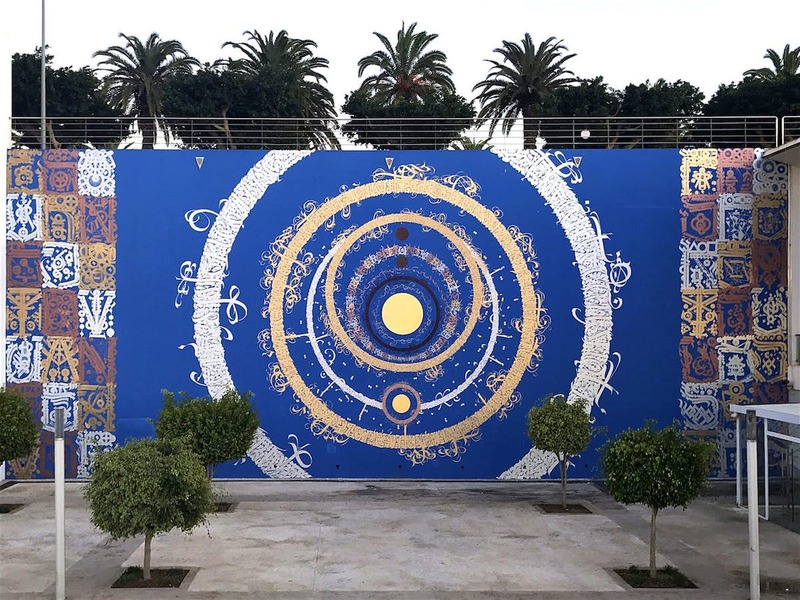 For Montresso Art Foundation's Off the Walls project in Rabat, calligraphist Tarek Benaoum painted 'Dahbia', an overlay of gold leaf and silver spirals and Native American, Arabic, Amazigh, and Latin script in translation of the Moroccan melodic poem 'Dahbia' by the poet Annejjar. Photo credit: Christian Koopmans. 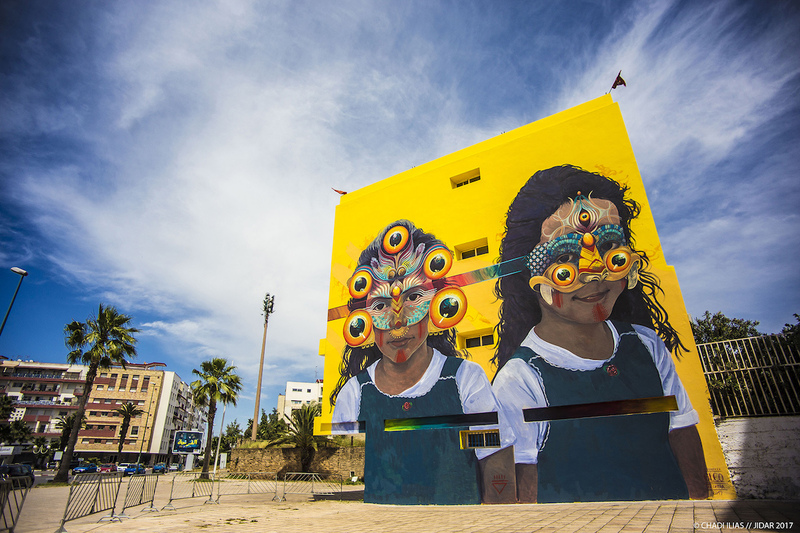 A piece by Canadian artist Danae Brissonet in Casablanca for Sbagha Bagha 2018. Photo credit: Hamza Nuino. 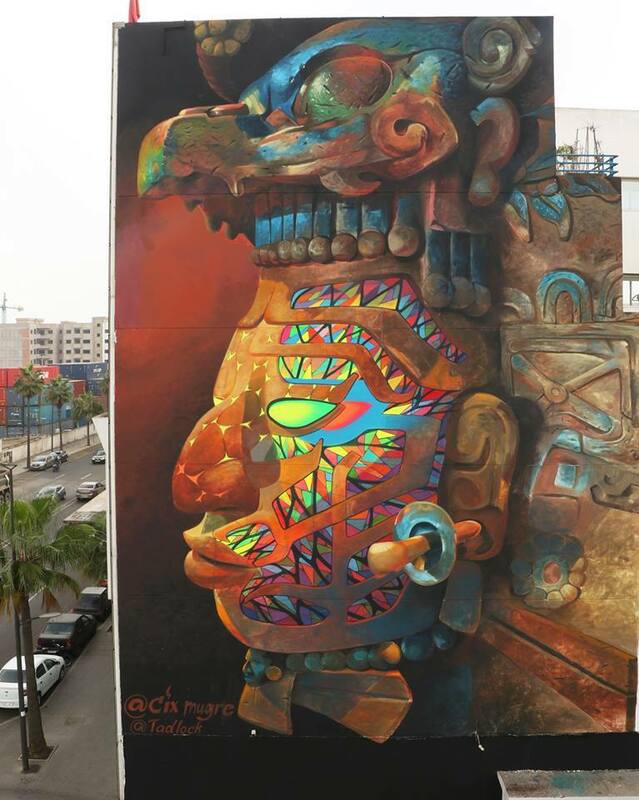 The Step that Transcends Time Is the Collective Step was a collaborative piece by Peruvian street artist Decretor and Moroccan street artist Machima. 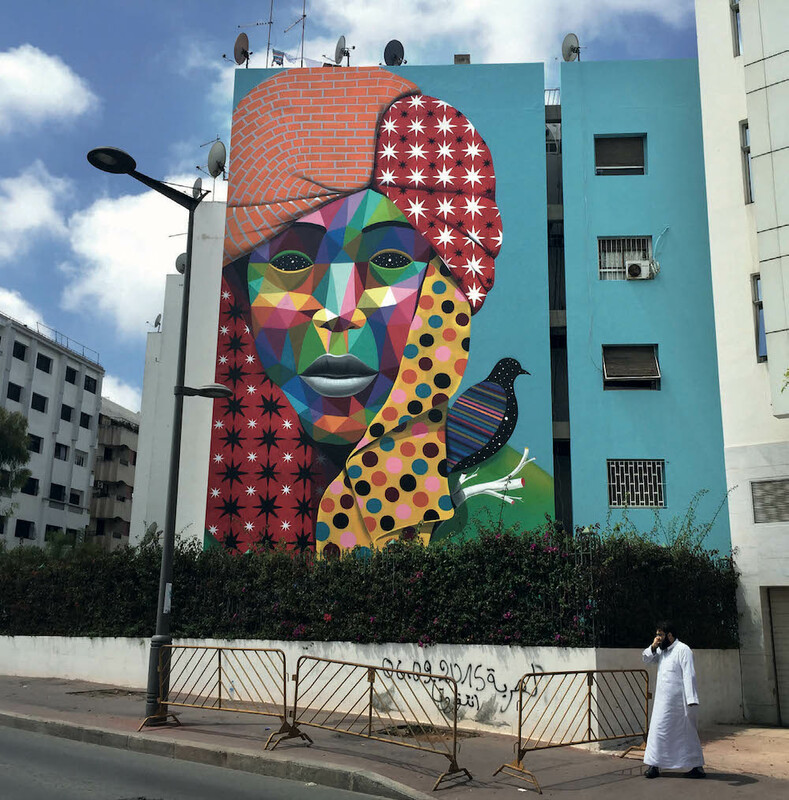 Their inspiration was simply a passerby in a red headscarf who caught the artists' attention, and now oversees the streets of Rabat. 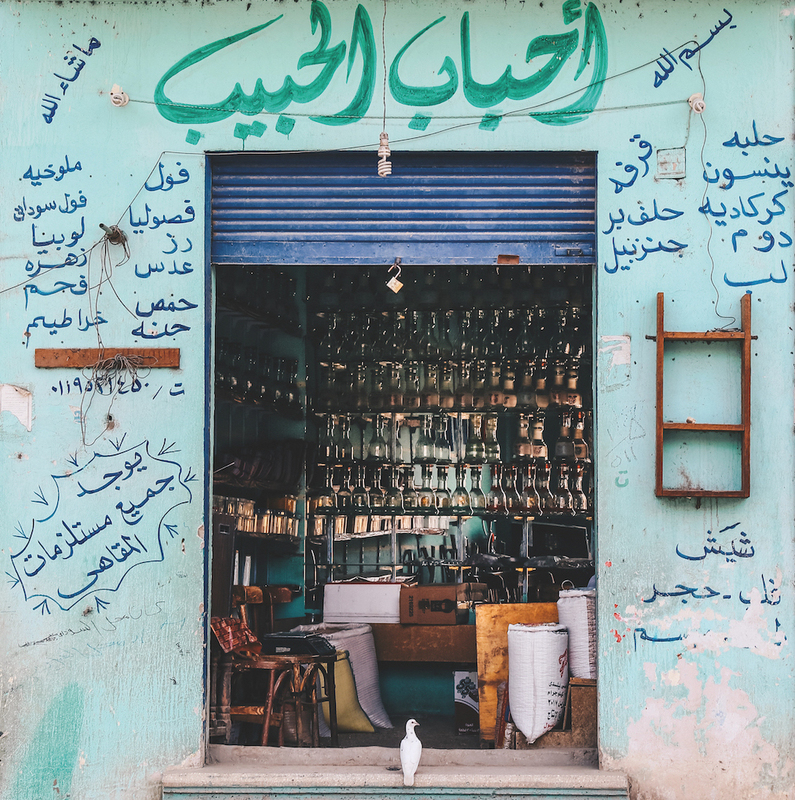 Photo credit: Walid ben Brahim. 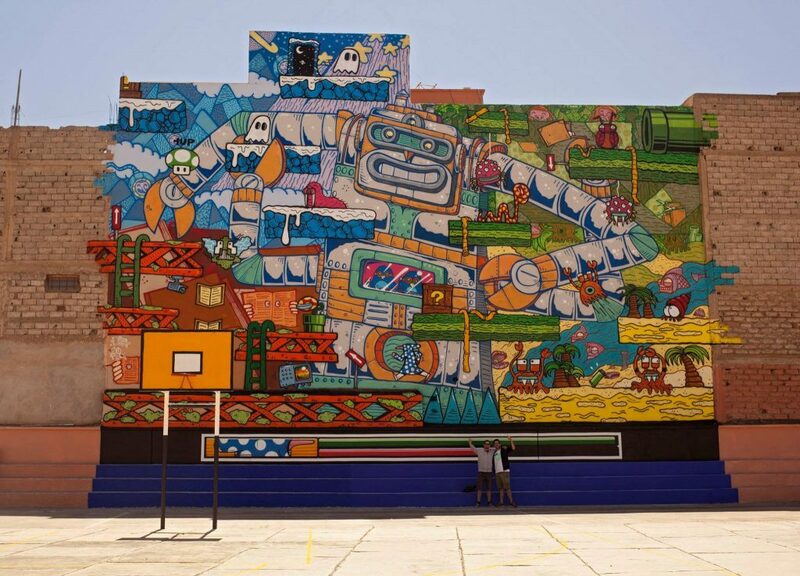 On the side of the Tariq Ben Zaid mixed high school in Marrakech, a monumental 360-square-metre mural was painted by French artists POES and JO BER after the school's headmaster reached out to the Marrakech Biennale in 2016 for an educational initiative. For a bit of perspective on just how massive this video-game-inspired smorgasborg is, check out the tiny, tiny men at the bottom, exemplifying the disappearance of the artist into their work. 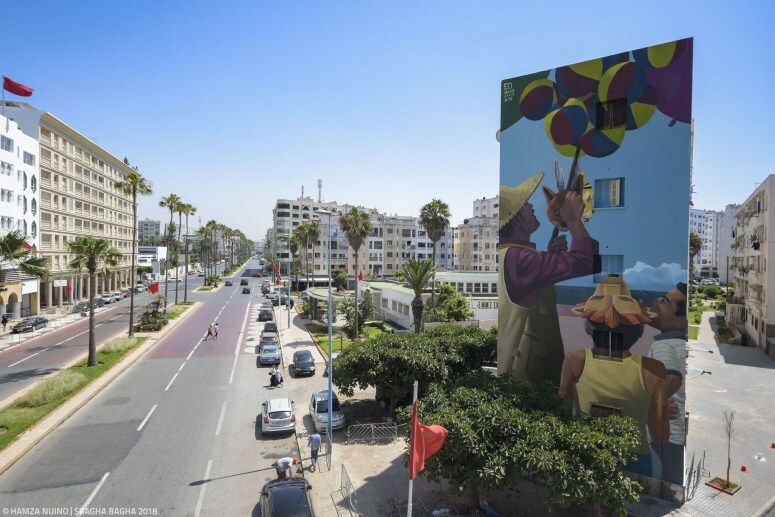 Overlooking Boulevard Moulay Youssef in Casablanca, Mohamed Touirs (aka Ed Oner) painted this beach-view mural for Sbagha Bagha 2018. Photo credit: Hamza Nuino. 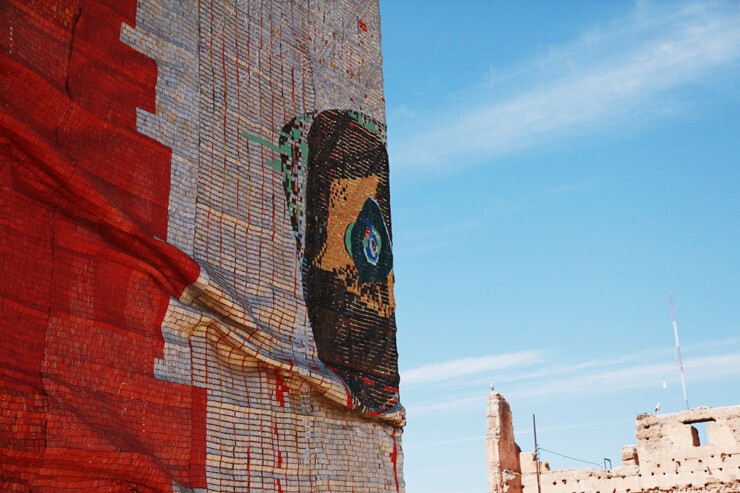 For the sixth Marrakech Biennale, Ghanaian artist and sculptor El Anatsui created this monumental tapestry at the Palais El Badii out of thousands of metal bottle caps. 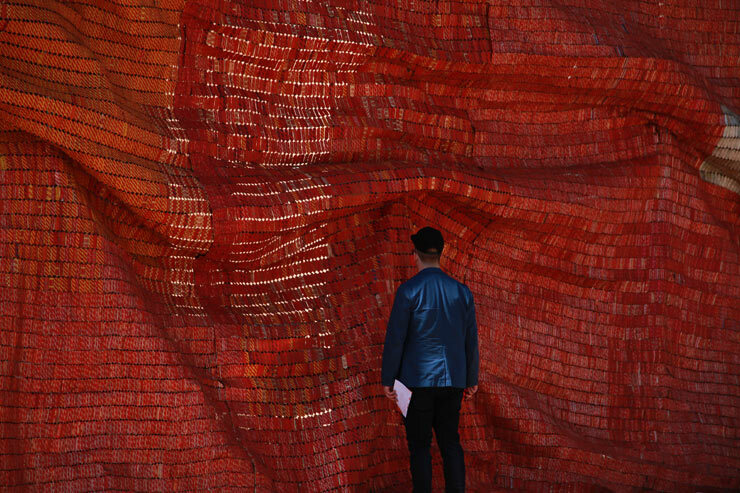 The entire 20-by-60-metre installation is sown together with copper wire in El Anatsui's trademark style of metallic, cloth-like wall sculptures. Photos courtesy of Jamie Rojo. 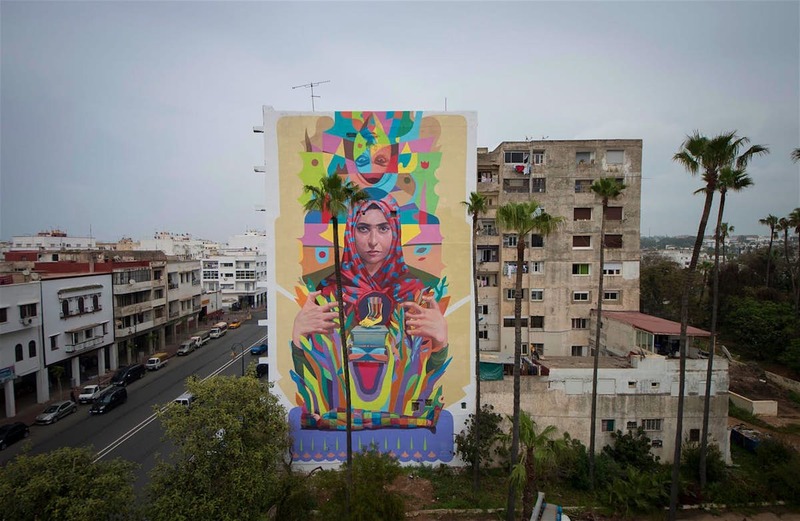 Moroccan artist Samir Iramo for Jidar 2018, Rabat. Entitled 'To the Moon and Back', this mural by Iramo is a tribute to the relationship between mother and son. 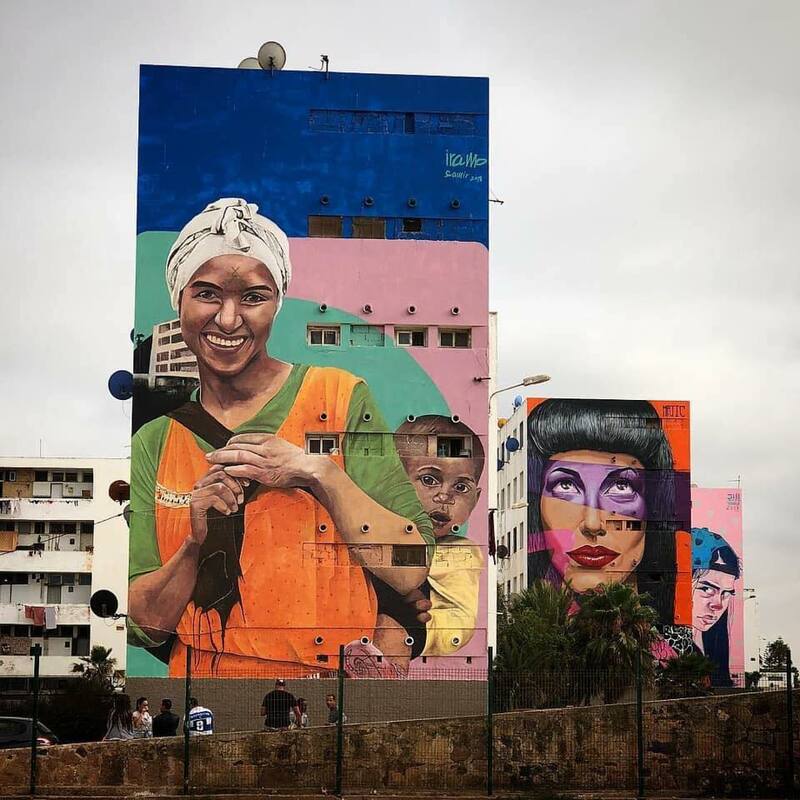 In the background, Moroccan artist Majid's 'Dream' from his series "Deep Purple" and Iramo's collaboration with Dynam, 'Rebellious Teenager' in Casablanca. 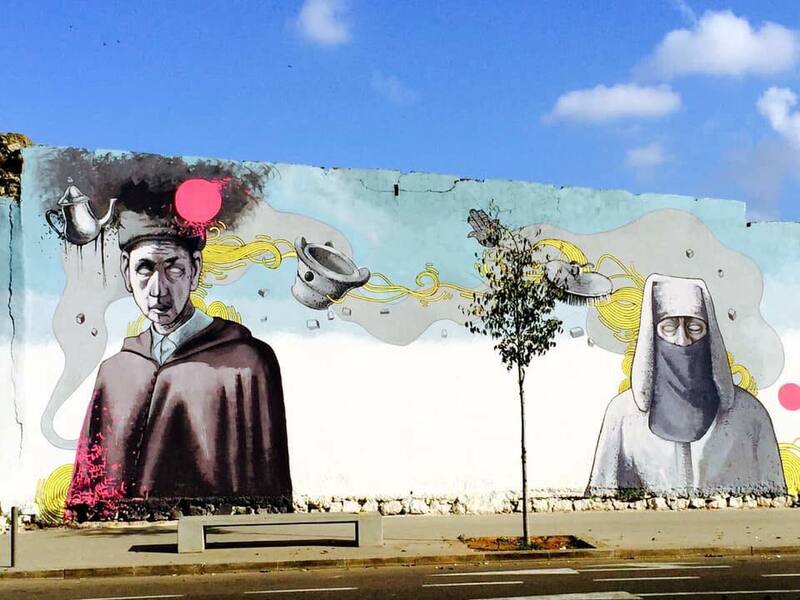 Street art by Iramo in Casablanca. 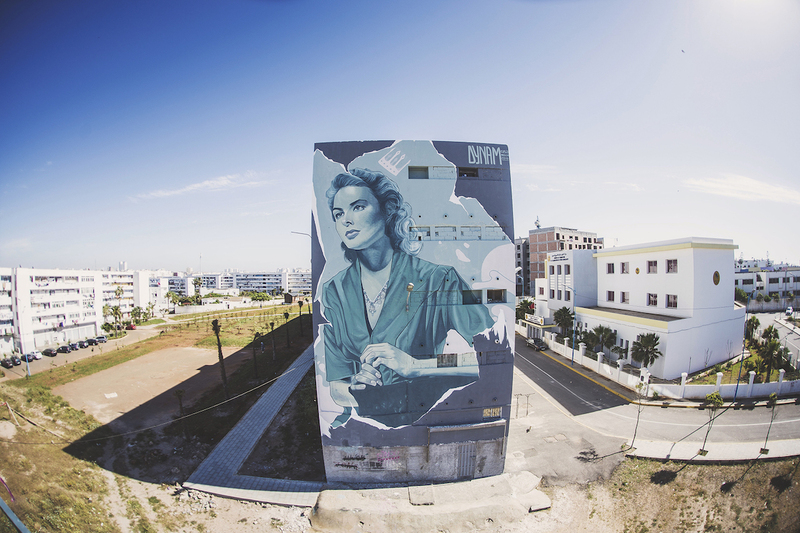 In Casablanca the city, a portrait of the star of Casablanca the film, Ingrid Bergman, who immortalised a romantic (if war-struck) image of the city in Western culture, by DYNAM. Photo courtesy of WeCasablanca. 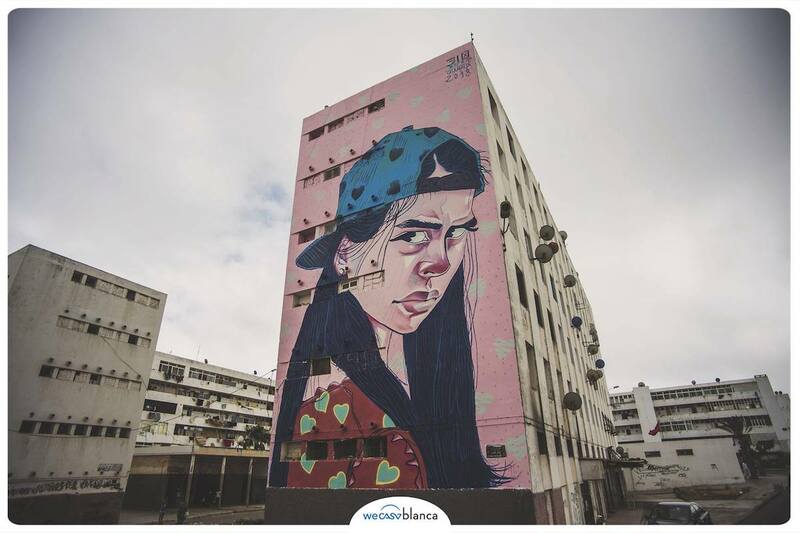 After meeting within the framework of street art project Casa Mouja, Iramo and DYNAM collaborated on another piece in Casablanca, the expressive rebellious Teenager. Photo courtesy of WeCasablanca. 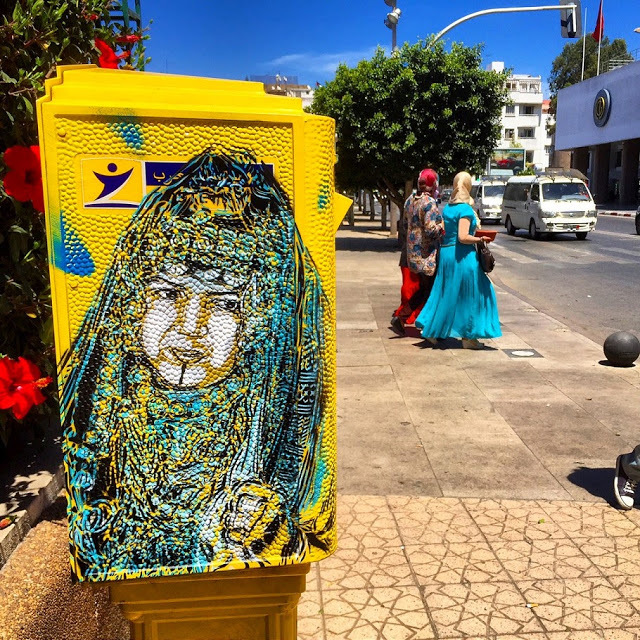 In 2015, French artist Christian Guémy (aka C215) painted a series of portraits on Rabat's mail boxes, depicting the ordinary people and what he saw as the iconic culture of Morocco onto the everyday urban fixture of the yellow mailbox. 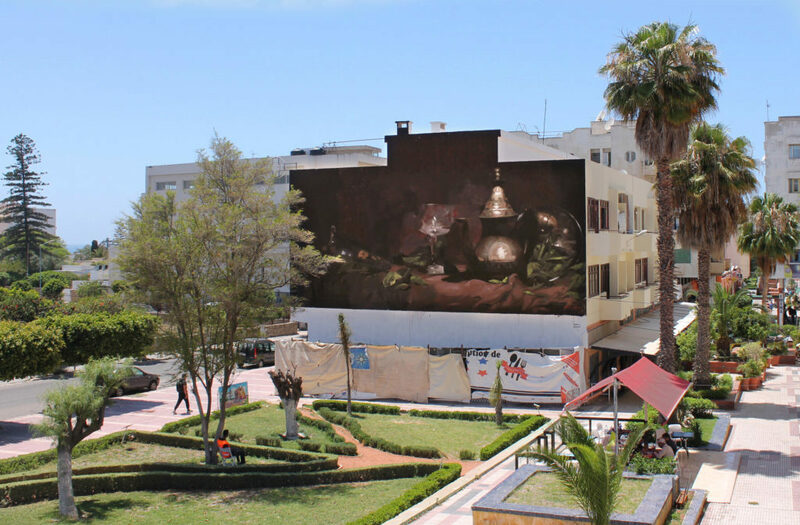 In the coastal city of Safi, Morocco-born Spanish artist Mohamed L'Ghacham Osfor painted this dauntingly massive still life, called 'servido en copa'. 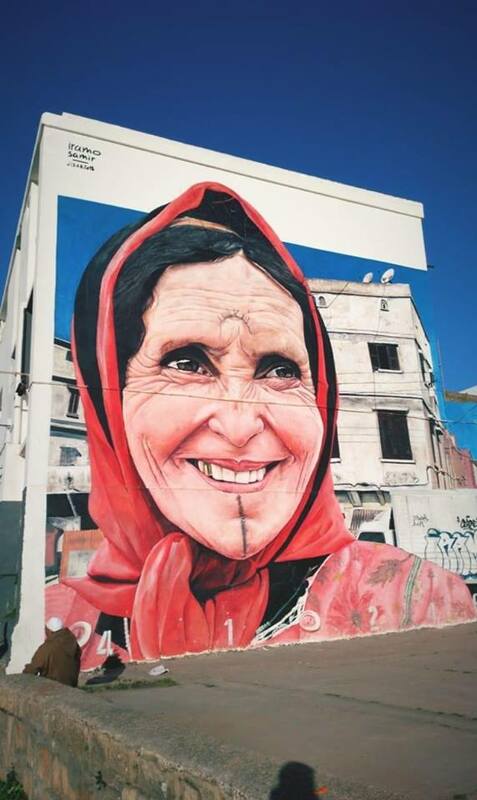 Spanish street artist Oscar San Miguel Erice (aka Okuda) painted this 'Mother Power' in Casablanca, paying tribute to motherhood. 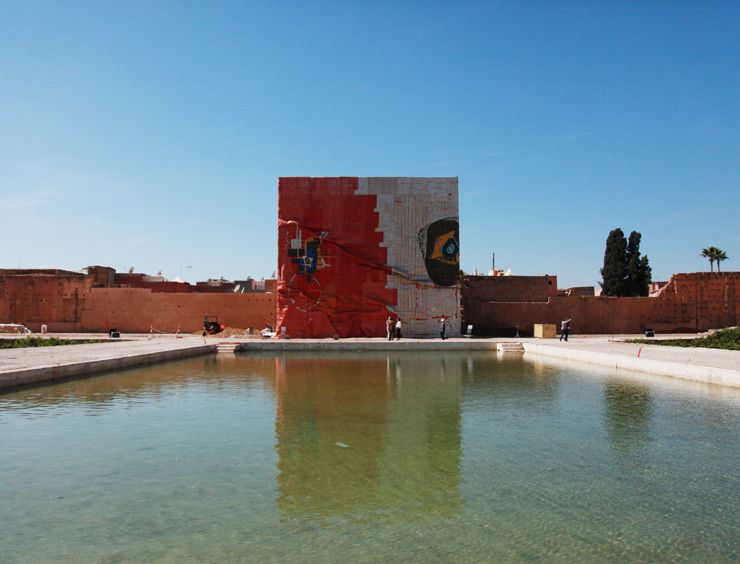 Image courtesy of WeCasablanca. 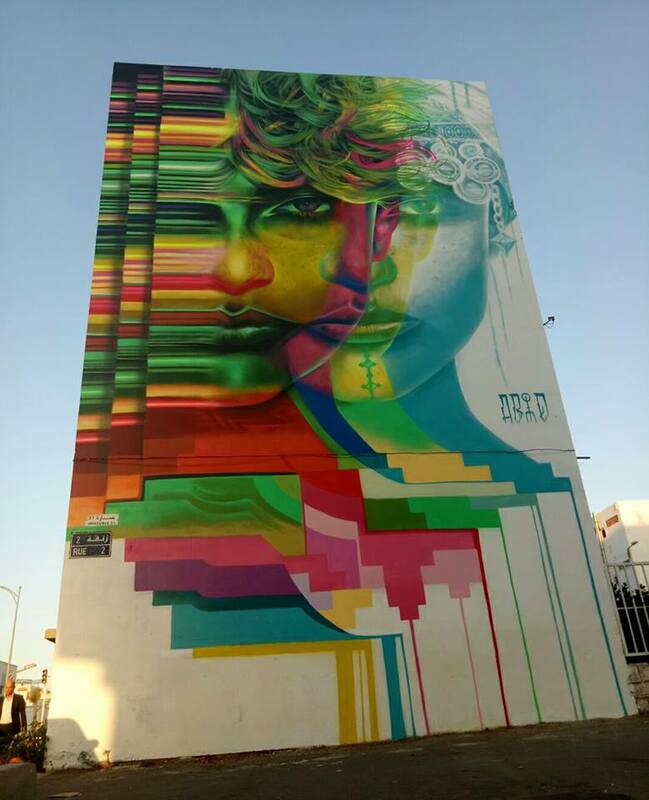 Commenting on this similar piece, Sahara Prince, Okuda says of his trademark style, "When I paint humans or faces with multi-coloured geometrics, I try to symbolise that all skins are one: all colours in one." For his last installation in his Tracing Morocco project, where he shed light on everyday Moroccan tradespeople whose business practices are under threat, German painter Hendrick Beikrich painted this portrait of Najma, a farmer from Morocco's Ourika Valley. Photo courtesy of the Montresso Foundation. Also from Beikrich's Tracing Morocco. 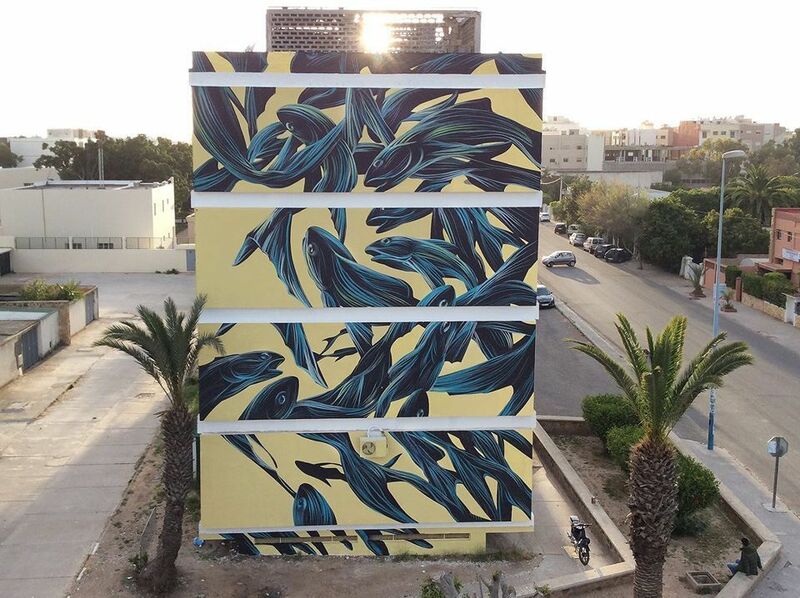 A piece by Portugese street artist Pantonio for Safi's Street Art Caravan. 'Rebuilt' by Cix Mugre and Tadlock. Photo credit: Antonio Triana. 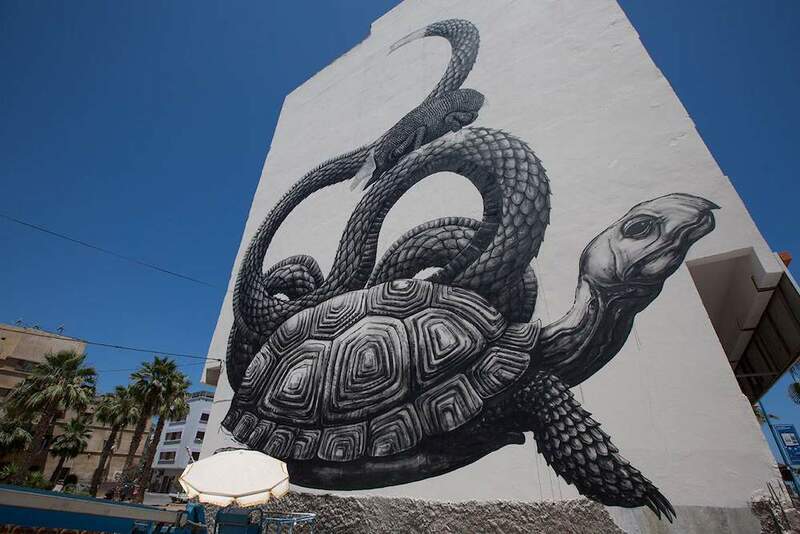 An animal-inspired mural by Belgian artist Roa in the Burgundy district of Casablanca. 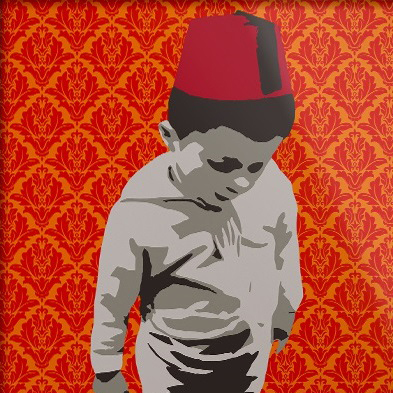 Image courtesy of WeCasablanca. 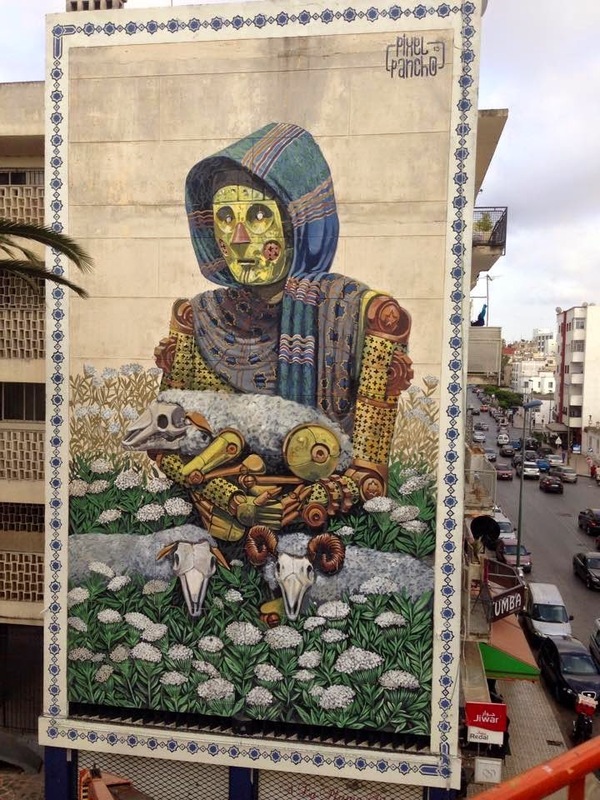 Robotic Shepherd by Italian street artist Pixel Pancho in Rabat for Jidar 2015. 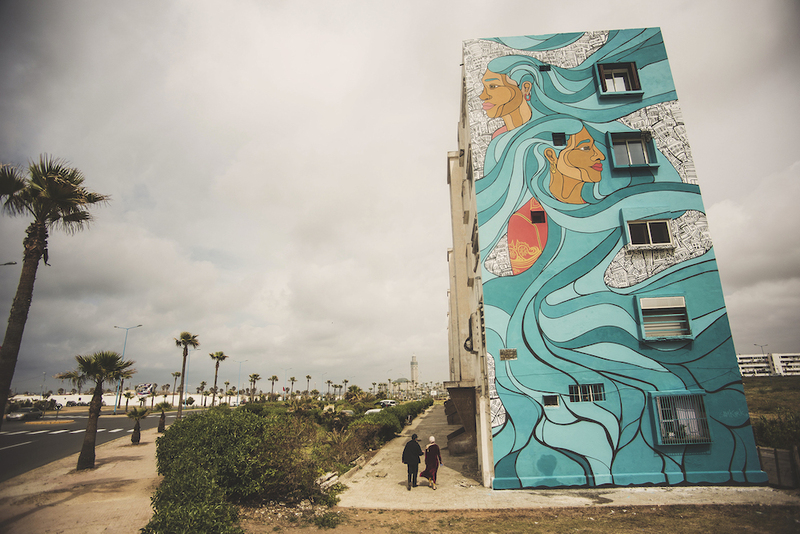 Sam Kirk, the first woman to participate in Casa Mouja, painted this mural of what appear to be two twin women in traditional Moroccan dress, with their hair in the wind facing the sea. 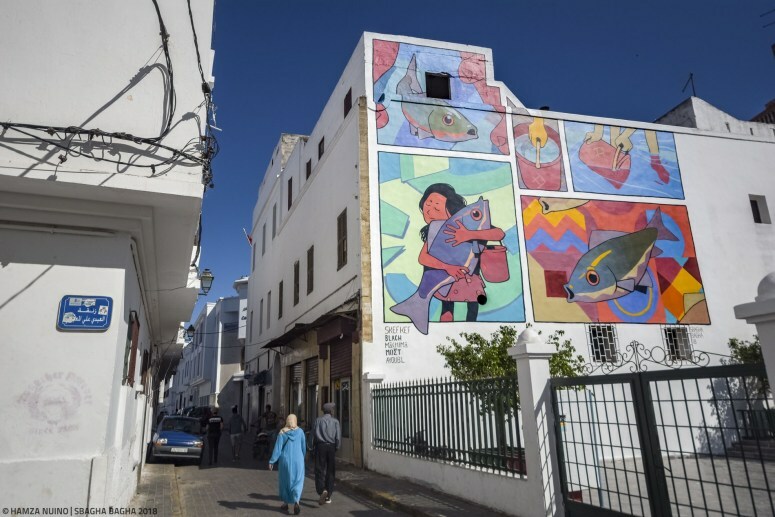 The mural is named Sister Cities, and is meant to symbolise the twinning of the cities of Casablanca and Chicago. Image courtesy of WeCasablanca. 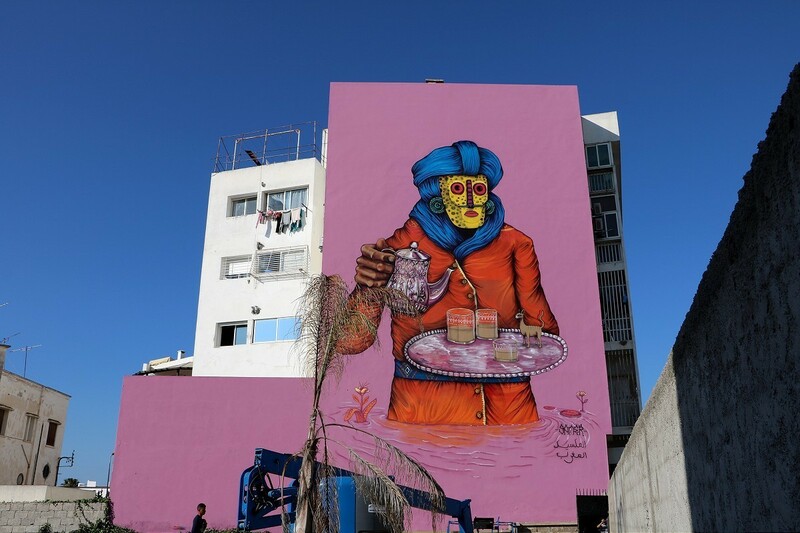 The Mexican artist known as Saner painted this mural in Rabat for Jidar 2016, combining his trademark influence of Mexican tradition and culture with Moroccan cultural motifs, as a comment on the potential connection between peoples. 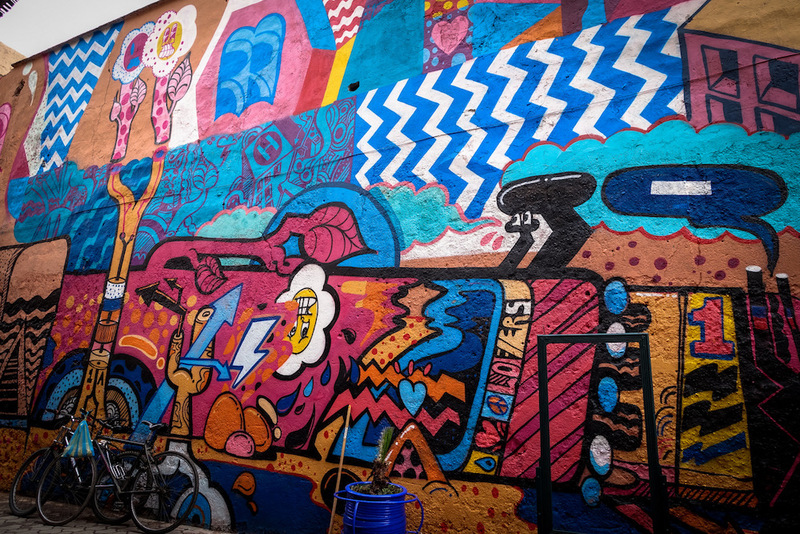 Speaking to Huffington Post on his participation in the sixth Marrakech Biennale, street artist Sickboy - a self-identified anarchist - said he chose to avoid his usual symbols of caskets and marijuana joints. Commenting on how this strand of street art, supported as it is by federal and corporate structures, deviates from original attitudes of deviance and rebellion that many artists, including him, originated from, he said: "I feel like this is in between what you do in the graffiti scene (and the reasons you do it) - and the art studio practice. There are different levels of compromise. Here you are just trying to respect the heritage of the building, the area, the people, the symbols." 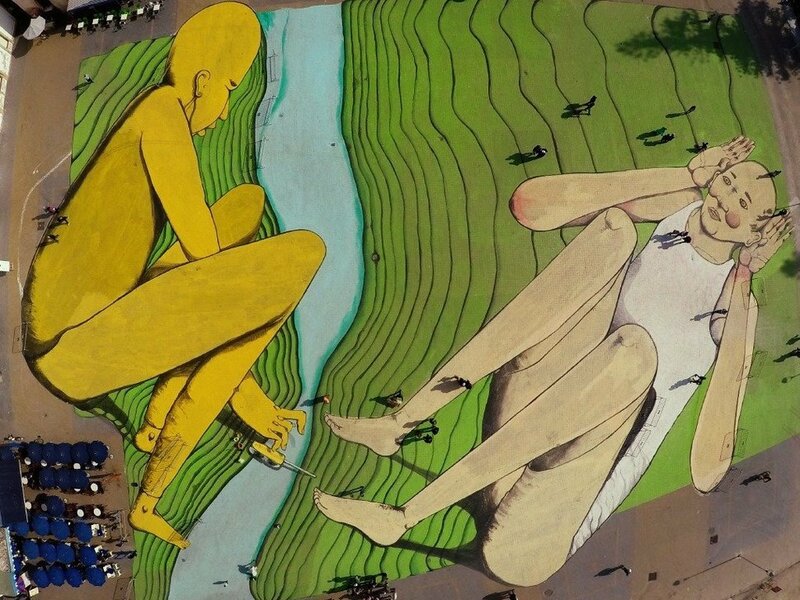 For the 2016 Marrakech Biennale, Italian artist Giacomo Bufarini (aka RUN) painted a giant 6,400-square-metre mural of two figures on opposite sides of a narrow river, seemingly trying to communicate. 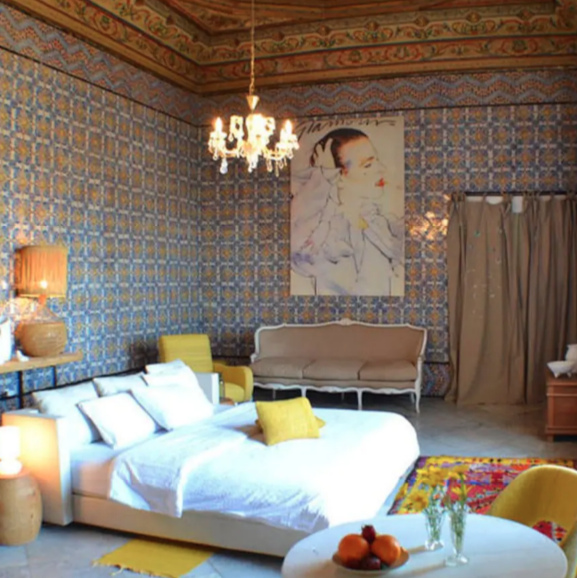 The massive fresco covers the entire floor of the Moulay Hassan square in the coastal town of Essaouira. The project is a long way away from where Bufarini started, running around with crews in Ancona, Italy, in the mid-1990s. 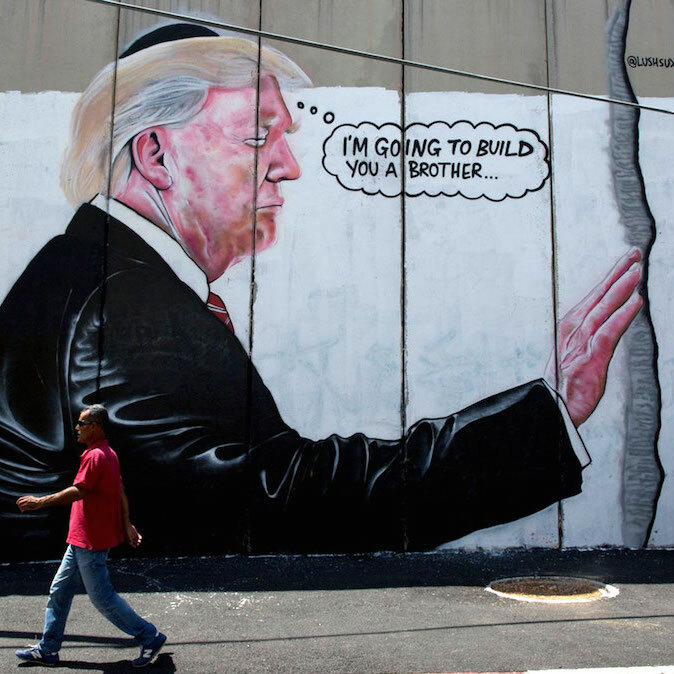 Though there is much to be said about what street art loses in terms of its resistance potential by tying to federal and corporate structures, it also enables giant murals that highlight the immigration crisis and the detrimental effect of borders. 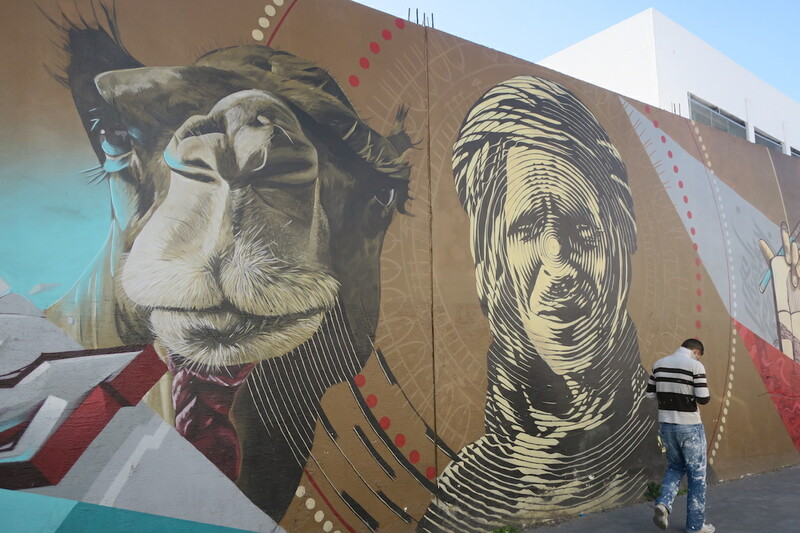 For Sbagha Bagha 2018, which focused on depictions of animals, Skefkef art collective painted this work in Casablanca. Photo credit: Hamza Nuino. 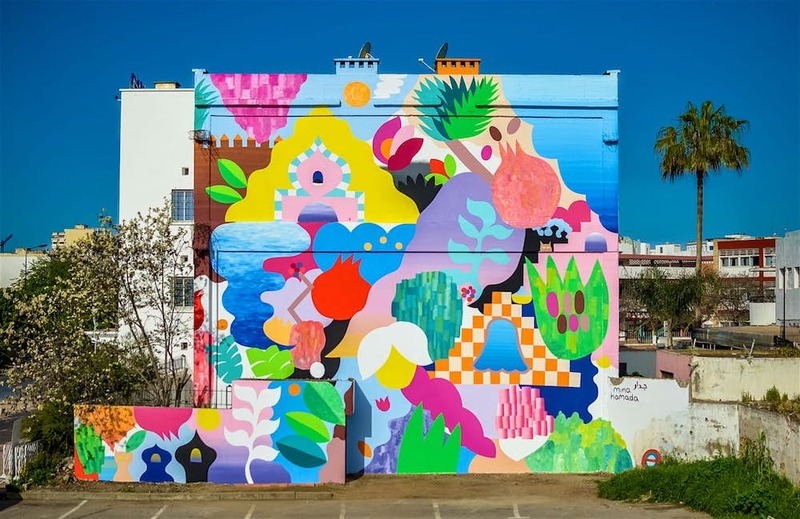 In a car park in Rabat, Mina Hamada painted this mural, translating the walled fortress of Kasbah des Oudaias which stands at the mouth of the Bou Regreg river into this vibrant dreamscape. 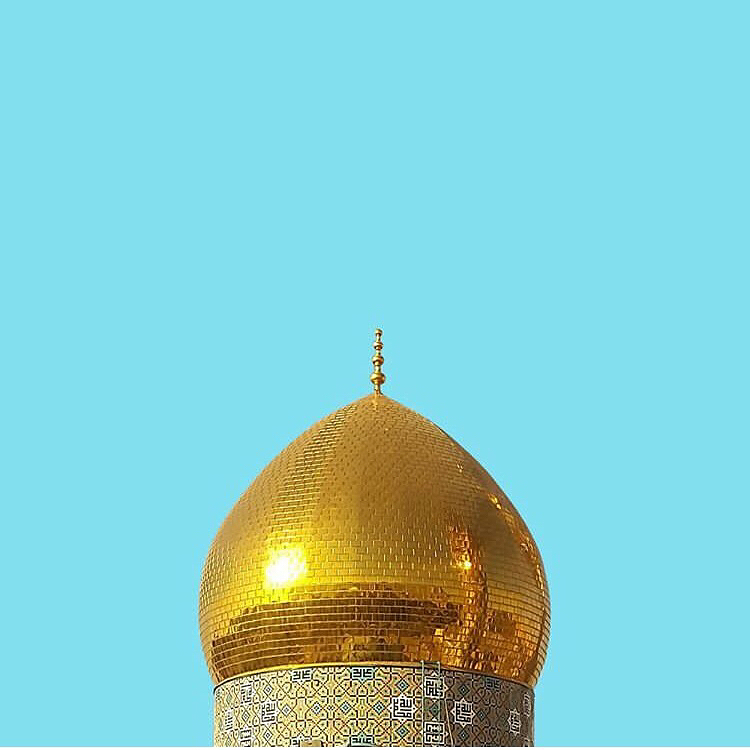 Photo credit: Hamza Nuino, Jidar 2018. 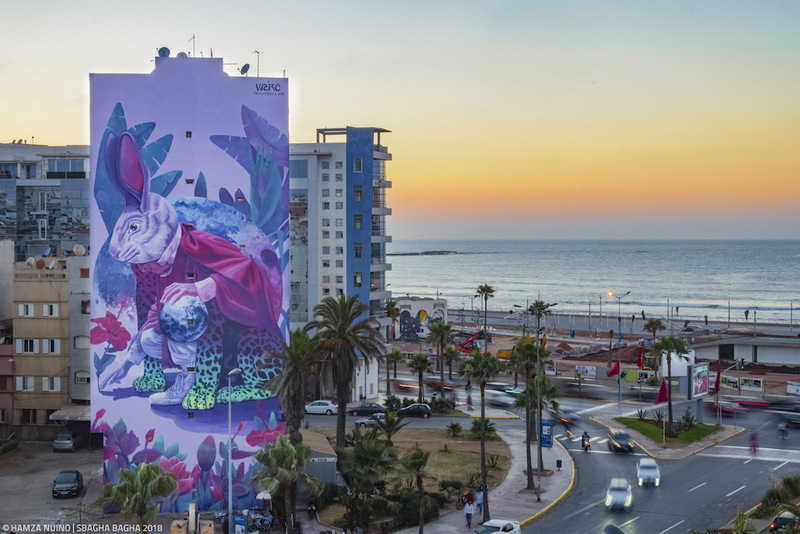 At the end of Zerktouni Boulevard in Casablanca, with his back to the Atlantic Ocean, crouches an enigmatic 98-metre-tall rabbit-man-panther in vivid pinks, greens, and blues, the work of Mexican artist Werc for Sbagha Bagha 2018. Photo credit: Hamza Nuino. 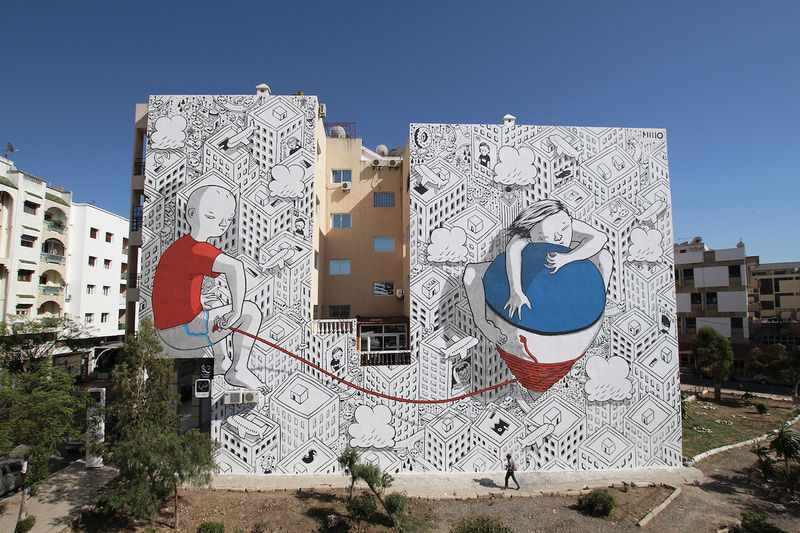 For the Street Art Caravne, Italian artist Franseco Camillio Giorgino (aka Millo) painted this mural, entitled 'You Make My Heart Spin Around', after being inspired by the most popular game among the children of Safi City, spinning tops (trombiya).